Today I have a project that means quite a lot to me. When I was a little girl my dad was in the military and we were planning a tour over in England. Knowing a lot of the television in the UK was quite different my dad recorded a few fun movies for me to watch. This was back when VCR's had just come out and I was about 9 years old. My favorite movie he recorded was "The Wizard of OZ" and I had to of watched it along with "Chitty Chitty Bang Bang", "Mary Poppins", and "Popeye" (with Robin Williams). In the course of the year and half I loved in the UK I had to of watched those 4 movies the most. Please feel free to check out all their amazing stores. I had a lot of fun designing this card. 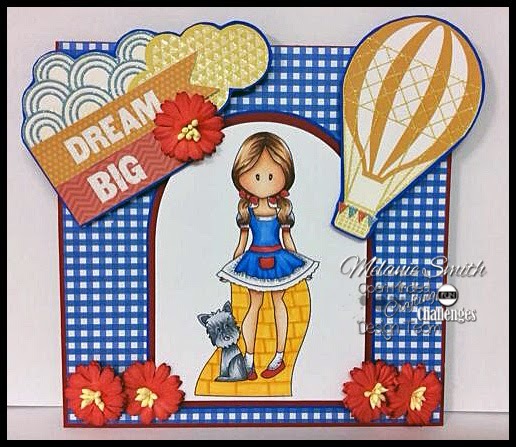 I fussy cut out the balloon and clouds and pennants from a piece of scrapbook paper and framed them to match. The sentiment was added because all Dorthy wanted was to get home. The Red flowers signify the Poppy field that she slept in when the wicked witch cast a spell on her. Then the Hot air balloon represents the Wizard's Hot air balloon that he drifted away in. 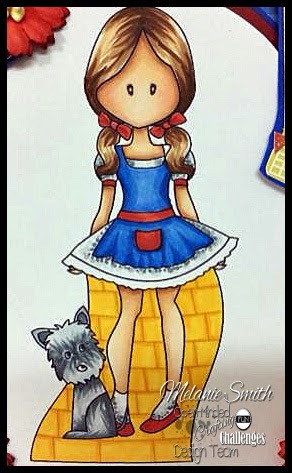 Just remember friends, there really is "No Place Like Home"
A close up of my coloring. As always, if you like my work I welcome you to click on the "Follow Me" button or sign up leaving your email address. Happy crafting everyone! THINK PINK in Honor of Those Fighting Breast Cancer. Breast Cancer Awareness is a topic that touches my heart dearly. A lot of you know that I sell AVON. Well My husband and I had a elderly lady who was a customer/friend of ours and even though her mother died from breast cancer she lived in fear of being tested. We visited her each month and she shared her fears with us. She even showed me her breasts and told me it was cancer eating her up. I tried to get her to go to the doctor but she said it was too far along. One thing I remember about Miss Jane was that she loved her football as well as her AVON. She used to purchase each breast cancer awareness product from our AVON brochure in memory of her mother. She was such a special lady. One month when we visited we brought her a breast cancer awareness teddy bear that I had purchased for her. It had a cute pink hooded sweat shirt on. Unfortunately Miss Jane did lose her battle on Easter Morning a couple months following that. She had fallen during the night and when a ambulance was called they realized what was happening they decided to take her to Hospice. We were told later that she refused to leave with them until she had her teddy bear. She held on to it for comfort as she was taken out by stretcher. She died before reaching Hospice. 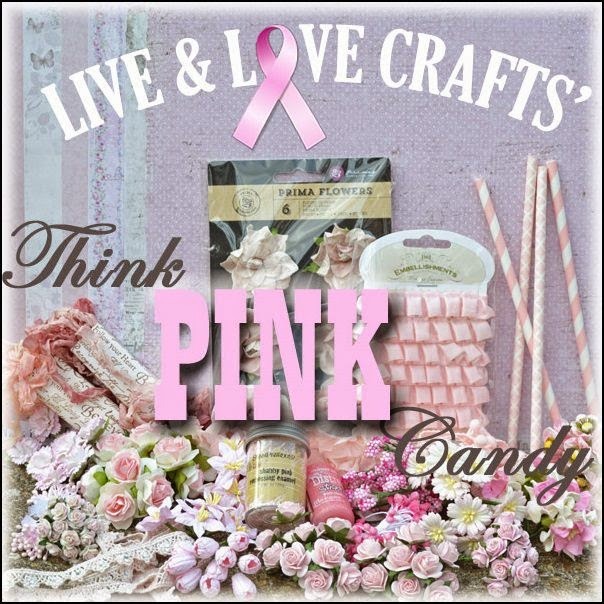 So In Memory of Miss Jane I am not only putting the Live & Love Crafts Blog candy photo on my side board but I am posting it really big on my main page in memory of Miss Jane. Please consider donating to the cause this month and every month and share your stories on your blog to reach out to others about this amazing cause. 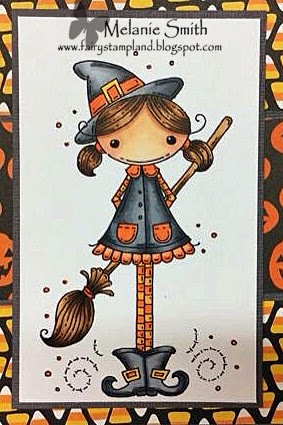 Creative Knockouts ~ Meljen'sdesigns "Little Witch Hazel"
Tonight I come to you with a fun NEW Challenge over at the Creative Knockout's Challenge Blog. Our Theme this time is simply "Halloween"! So lets see all your scary and fun projects. 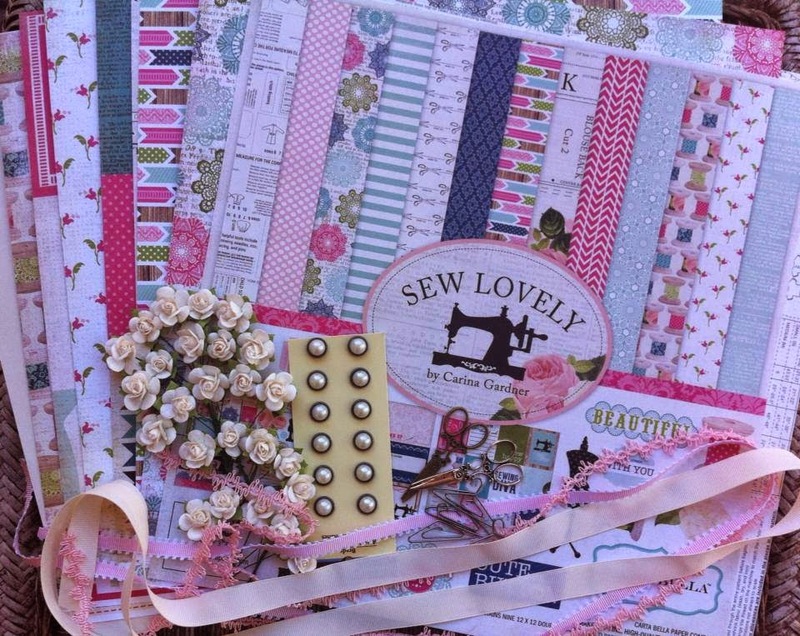 The image I have chosen to work with is from our amazing sponsor this week, Meljen's Designs. The image name is "Little Witch Hazel" You can pick her up in the Meljen's Store. She was such fun to color with my Copic Markers. 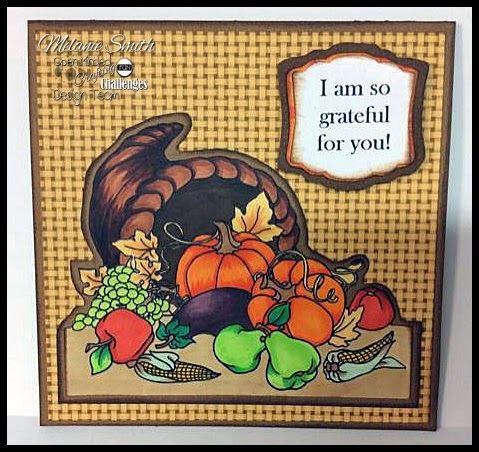 I hope you will stop by the Creative Knockout's Challenge blog to see the rest of the design team cards. They are all quite magical. Treasured Times Inspirational Post ~ Little Girl, Big Hat! Today I am excited to bring you my newest Insprational Card for the Treasured Times Inspirational Team. 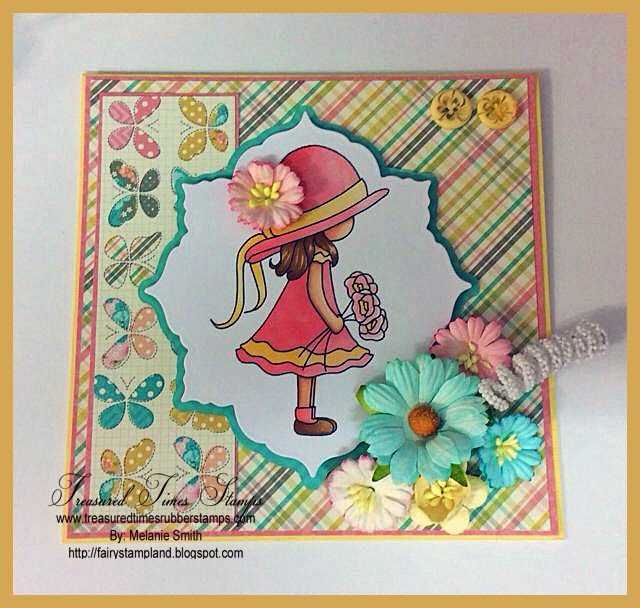 I choose to color up this adorable stamp called "Little Girl, Big Hat" She was such fun to color. Thank you for stopping by today. Please feel free to leave me a comment and to "follow" me. I love all the feedback. I hope you have a beautiful day! 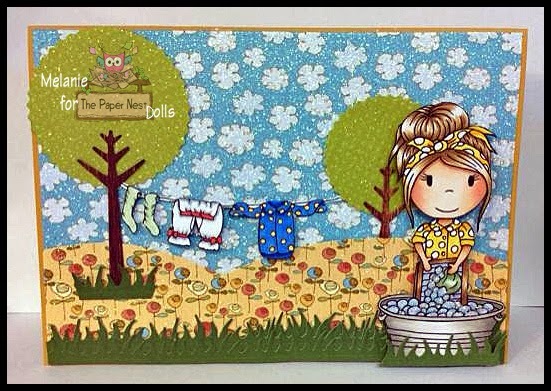 The Paper Nest Dolls "Happy Birthday" Blog Hop! 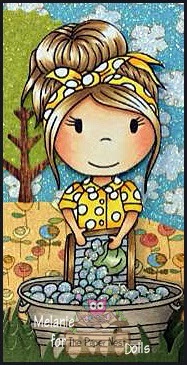 For my card I have decided to use the adorable "Washing Clothes Ellie w/ the Clothes Line". I have used some Heidi Swapp designer papers and some die cut trees and grass. This was so much fun to create the scene with. Make sure to participate so you have a chance at winning this stamp along with the other amazing prizes. I would love for you to consider "following" my blog as well. There are over 13 prizes up for grabs along the way so make sure to visit and comment on each of the design teams blogs. To be eligible you must leave a comment on every blog and for the main prize you must also follow the Paper Nest Dolls blog! Here is the complete lineup for anyone who may get lost along the way. All stamps are 25% off from the October 19-20th these 2 days ONLY! But, commenting will be left open until October 24th so that gives everyone time to hop and comment. 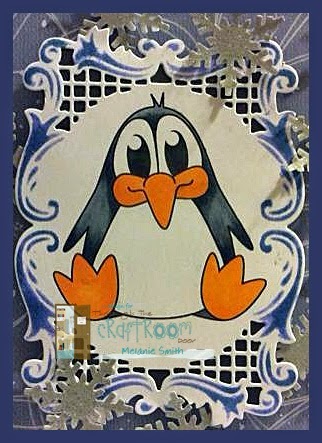 Through The Craft Room Door ~ Dr. Digi House of Stamps "Cuddly Critters Penguin"
Today Through The Craft Room Door Challenge Blog is starting a new ANYTHING GOES challenge. Our sponsor this time around is Dr. Digi's House of Stamps and I have chosen to use the "Cuddly Critters Penguin" Stamp. I was on vacation when I colored this adorable little guy up then realized when I got to working on him this evening that I didn't have any matching papers. With the deadline approaching quickly I decided to pull in blues to pull out the cool colors in the cool grey Copic markers. I choose this swirly background paper because it made me think of the swirly winter winds. 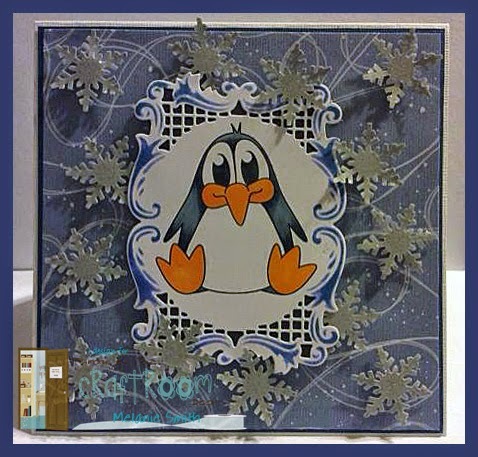 I added some glittery snowflakes all over to give the sense of winter and snow, after all, penguins do live in very cold climates. I used a Joy Craft Die inked with Tim Holz Distress ink to tie the image into the blues of the paper. I think this little guy came out quite cute, especially with my dilemma. 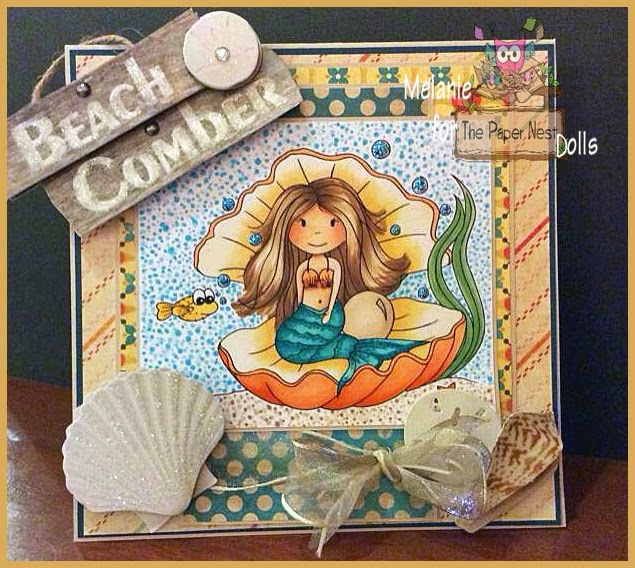 The Paper Nest Dolls ~ New Anything Goes Challenge with Guest DT Spot! I just recently went to Myrtle Beach with my husband and mother. We had an amazing time enjoying the beach and searching for shells. I took my Copic Markers along with me and colored this image while away. It was perfect considering where I was. 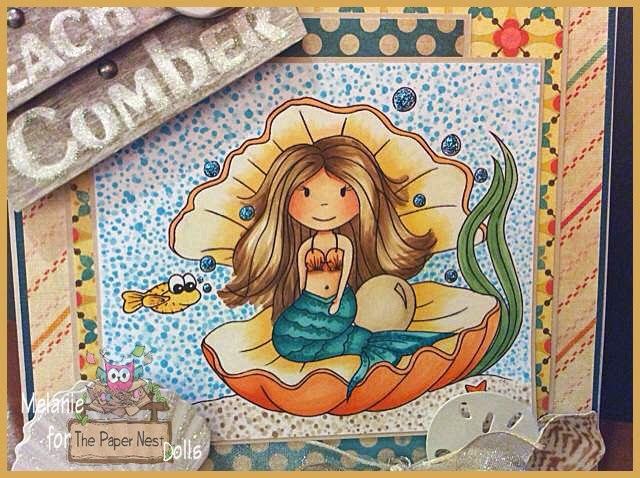 It is called "Mermaid in Clam Shell". My mom and I went out craft shopping one day and while she shopped for beading items she spotted these 3-D stickers that went perfect with the nautical theme I had in my mind for this mermaid. The weather has cooled a bit here in the south and it is time to pull out the warmer clothes. 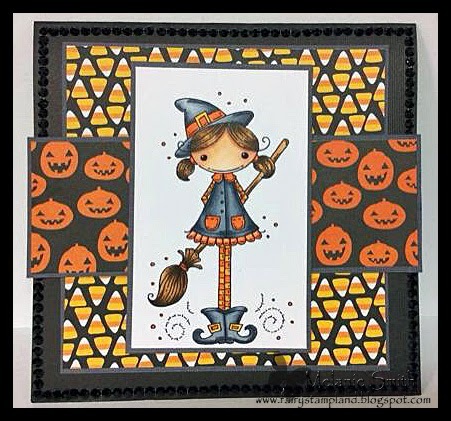 So now that we are in October the Open-Minded Crafting FUN group has a fun new FALL challenge for you. We want to see any cards with either pumpkins or Jack O Lanterns in them. Make sure to enter your cards over at the challenge blog by clicking HERE! My image is called "Cornucopia" by Robyn Fetish Digital Images. 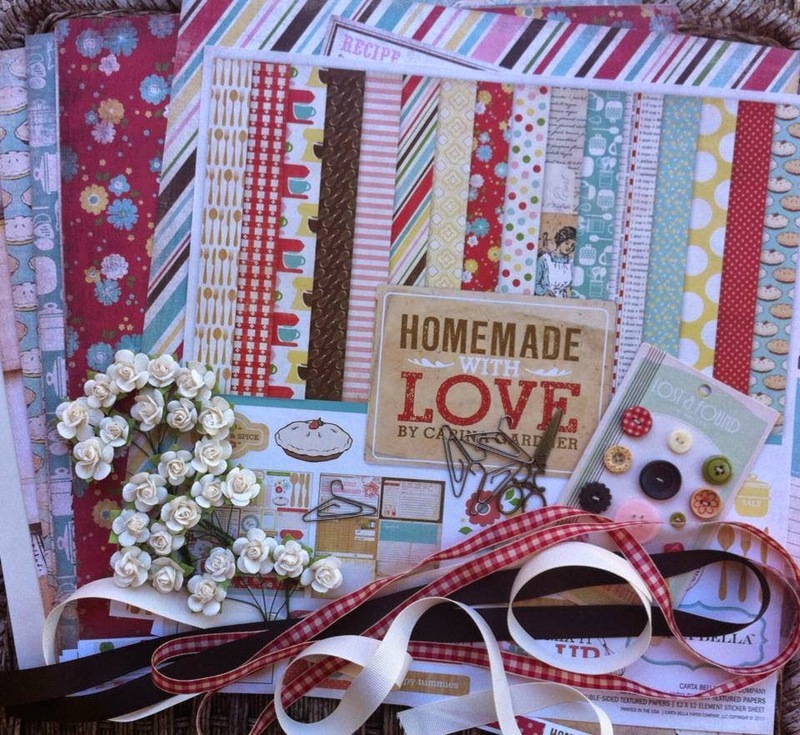 Please stop by the challenge blog to see all the wonderful creations from our design team. Thank you for stopping by today. 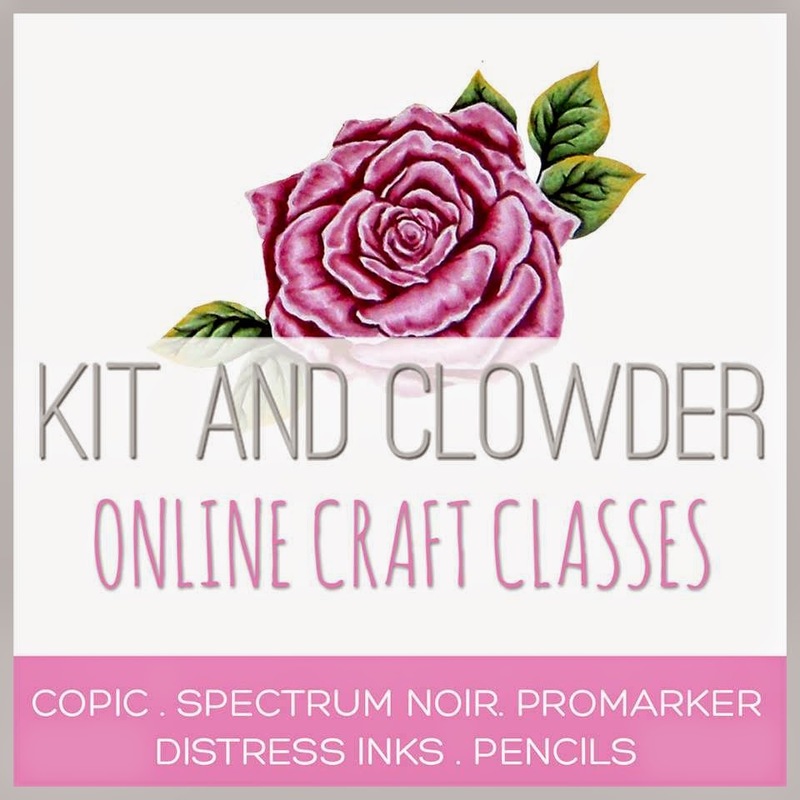 Please consider "following" my blog and in the comment section leave me a link to yours and I will return the favor :-) Happy crafting my friends!